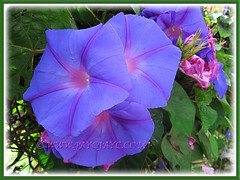 Ipomoea indica or Blue Morning Glory will be a great addition to your garden. You can plant it over your trellis or allow it to climb over a tree to show off its captivating blooms. 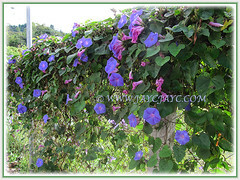 It is an ever-blooming vine that will brighten and add colour to your garden. 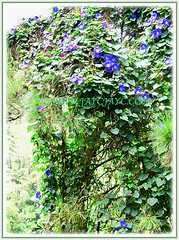 An amazing climber with spectacular and vibrant blue flowers. 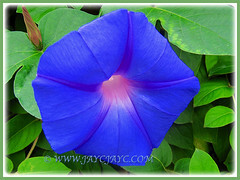 Common Names: Morning Glory, Blue Morning Glory, Oceanblue Morning Glory, Blue Dawn Flower. Etymology: The generic name is derived from the Greek words ipos meaning worm or bindweed and homoios meaning to resemble in reference to their twinning habit. The Latin specific epithet indica means from India or the West Indies. Origin: Native to tropical habitats throughout the world or pan-tropical regions. It is naturalized elsewhere, including eastern Australia, southern Europe, southern New Zealand, southern USA, Pacific Islands and eastern and southern Africa. 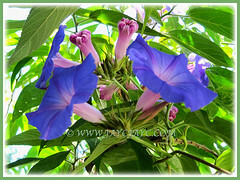 Plant type: An ornamental tropical climber or vine. 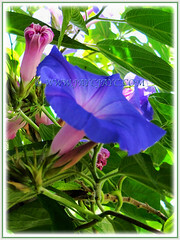 Features: Ipomoea indica is a species of the genus Ipomoea that comprises of over 500 species of flowering plants. A vigorous-growing perennial twining climber that grows up to 6-10 m in height but sometimes scrambling over low vegetation or creeping along the ground. The stems usually develop a twining habit although they occasionally spread across the ground. These stems are fairly densely covered in spreading or backwards-curved retrorse hairs when young and they occasionally also exude a white milky sap when broken. The alternately arranged leaves (5-18 cm long and 3.5-16 cm wide) are borne on stalks petioles 2-18 cm long. The simple leaves range from heart-shaped to obviously three-lobed and have pointed tips. Both leaf surfaces are softly hairy, the undersides more so. 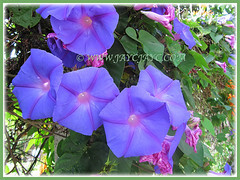 The funnel-shaped tubular flowers are bright blue or bluish-purple in colour with a paler pink or whitish-pink central tube. These large flowers, measuring 5-10 cm long and 7-10 cm across are borne in clusters of two to twelve in the leaf axils. They have five long and narrow sepals that are 14-22 mm in length. 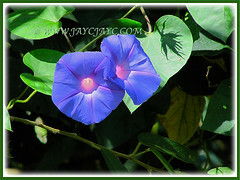 The common name ‘Blue Dawn Flower’ is descriptive as flowers open in the morning and for this reason it is also commonly called the ‘Morning Glory’. Flowering can occur throughout the year. The fruit are globular papery capsules, about 10 mm across and contain about four to six dark brown or black coloured seeds. 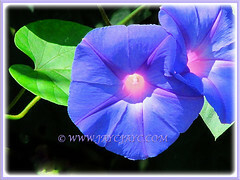 Culture (Care): Ipomoea indica or Blue Morning Glory can be easily grown with minimum care. Light: Best in full sun. Can be in semi-shade. Moisture: Moderate water requirements. Water regularly but do not overwater. Soil: Best in well-drained and loamy soils. Others: You may want to prune to keep it low and tidy. It can be a noxious weed and is considered an invasive species in Australia, New Zealand and South Africa. Generally free from serious insect or disease problems. However, do watch out for spider mites and whiteflies on indoor plants in greenhouse. For subtropical and temperate regions: Hardiness: USDA Zone 9a – 11. Ipomoea indica does not tolerate temperatures below 7°C. They do die back at the first frost but return from the roots each year and keep on blooming prolifically. It has been known to grow in zone 8 too. It is grown in a greenhouse in the temperate regions. It produces flowers over a long period from late spring to autumn. Being an annual or tender perennial vine, it is advisable to grow indoors as houseplants. Propagation: By seed sown singly or by softwood or semi-hardwood cuttings. It can also be propagated by simple layering and from broken fragments of stems that produce new roots at the nodes. 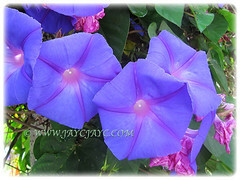 Usage: Ipomoea indica or Blue Morning Glory are widely cultivated as a garden ornamental. Excellent when grown on the ground. Ideal too if grown in a large tub or container and located at the patio or deck. Lovely when it is trained over a trellis or tree. If you’re a nature lover, grow it as it attracts bees, butterflies and birds.